Coyuchi is the original organic cotton bedding company, dedicated to designing beautiful textiles made solely from environmentally sound fibers. 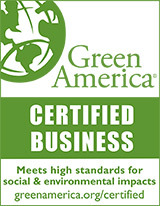 Unlike "natural" or "untreated" cotton, Coyuchi organic cotton linens are made from hand picked organically grown cotton, certified by SKAL. Luscious fibers, beautiful finish; finally bedding you can feel good about. Coyuchi Organic Cotton assures a safe and comfortable night's sleep! Free Shipping for Coyuchi orders over $149. Use coupon code coyuchi149 when checking out on the shipping cart page. Applies only to Coyuchi Bed and Bath items. Coyuchi 220TC Percale is our exceptionally well-priced introductory organic cotton sheeting. You'll be amazed at the exquisite detail and hand of these luxurious fabrics. Coyuchi is the Mexican-Spanish name for naturally occurring brown cotton used for centuries by native people of the Americas. 100% Organic cotton, certified by SKAL to comply with the International Federation of Organic Agriculture Movements (IFOAM) standards. 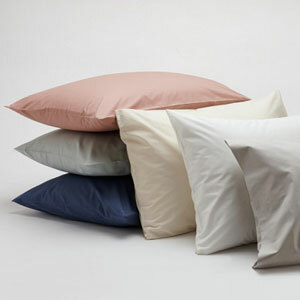 Percales flat sheets are made with a 4" hem at the top and a half-inch hem on the sides and bottom. 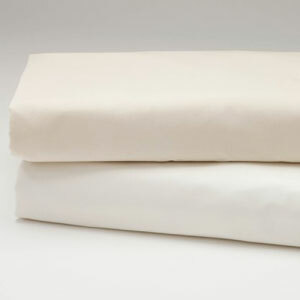 Fitted sheets are constructed with a high-quality elastic that runs all the way around the bottom. The 15" pocket depth is designed to accommodate thicker mattresses. Sheets sets include one fitted, one flat and two cases. 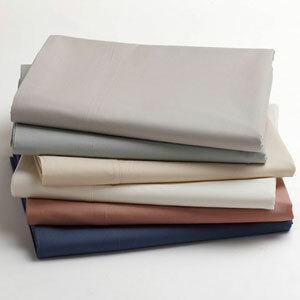 Twin sheet sets include one fitted, one flat and one std case. Cases are sold in pairs. The fabric is pre-shrunk and the finishing process gives Coyuchi bedding an exceptionally soft, inviting hand and a natural opulence. White is bleached with hydrogen peroxide. 100% Organic Cotton; 220 Thread Count. Flat Sheets Twin 68x108, FU/QU 90x106, King 108x106. Fitted Sheets: Twin 39x75x15, Twin X-Long 39x80x15, Full 54x75x15, QU 60x80x15, Cal King 72x84x15, King 78x15x80. Cases: Std/Queen 20x32, King 20x40. All Coyuchi cotton and linen products are machine washable. Line dry, or tumble dry low and remove promptly. Use a warm iron on cotton, or a hot iron on linen, as needed. We do not recommend using whiteners as bleaching agents may diminish the brilliance and depth of the colors; when needed, use only non-chlorine bleach. Please refer to the product tag for more specific instructions. Ships in 1-2 days. Allow 2-4 weeks for items out of stock. No returns without prior authorization. Merchandise must be in new, resalable condition and is subject to a 10% restocking fee.